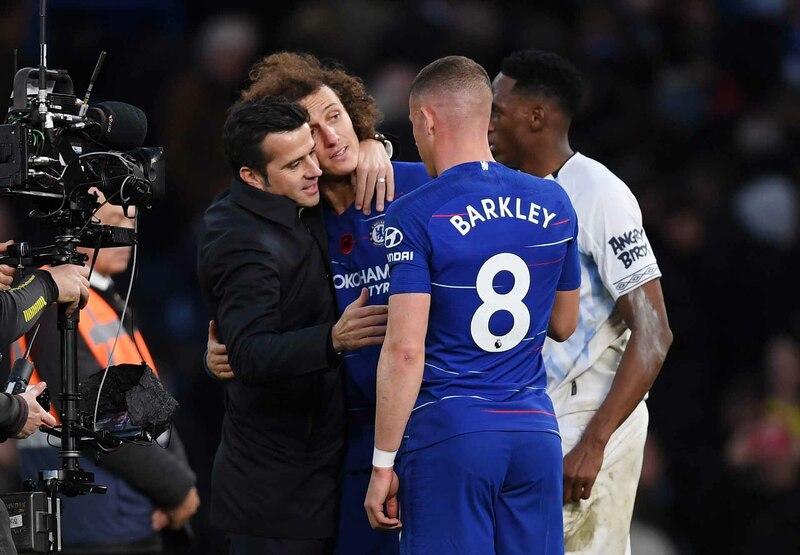 Marco Silva, Manager of Everton embraces David Luiz as he speaks to Yerry Mina of Everton and Ross Barkley after the Premier League match between Chelsea FC and Everton FC at Stamford Bridge on November 11, 2018 in London. It’s back to league action on Sunday as we travel to Goodison to keep our top four hopes alive. A trip to Everton is one of the best away days in the league and one of the best grounds that I’ve personally visited. After the 0-5 victory in Kiev, we’ll undoubtedly see Ruben Loftus-Cheek and Callum Hudson-Odoi drop back to the subs bench, with Ross Barkley, making his Goodison return and Pedro coming back into the fold. Hat-trick hero Olivier Giroud will be replaced by Higuain, who was left out of the travelling party to Kiev with an upset stomach and fever. The likelihood is that Jorginho, Azpilicueta and David Luiz will return too, along with Eden Hazard. Kurt Zouma won’t be available for Everton, due to Chelsea being his parent club. Seamus Coleman and Leighton Baines might be in contention to start for the Toffees. When we played Everton earlier in the season, we drew 0-0 with Maurizio Sarri bemoaning the fact that we passed the ball too slowly during the first half and we had to sort out the problem of how to approach games. Although the 0-0 draw was disappointing at the time, it was our twelfth league game without defeat and we were four points behind leaders Manchester City. In recent times, we’ve had quite good success at Goodison; who can forget the 3-6 victory in August 2014? Goals from Diego Costa in the first minute and Branislav Ivanovic in the third minute got us off to a fantastic start. Then in a vital game in April 2017 we came away with a 0-3 win, which ended with huge celebrations as it pushed us closer to winning the title. Goals that afternoon came from Pedro, Cahill and Willian. Our last defeat in the league at Everton came in September 2015, when Steven Naismith scored three for Everton, to beat us 3-1, however, we’re undefeated in the last six. Everton were founded in 1878 as St Domingo Football Club. Goodison Park is arguably one of the most iconic grounds in the Premier League; it was opened in 1892 and has a great feeling to it. I particularly enjoy where the away fans are housed, either in the Bullens upper, or lower tiers. There are parts of the ground where you could end up sitting behind a pillar, but fortunately for me, that’s not happened, yet. Goodison Park was one of the venues for the 1966 World Cup and it hosted the Semi-Final between West Germany and the USSR. With Manchester United playing in the FA Cup this weekend and both Arsenal and Tottenham having a weekend off, a victory for Chelsea will lift us up to fifth in the league and within a point of Tottenham. The top four is within reach for us, but we have to remain consistent, strong and to take chances that are presented. My Prediction: The last two games have finished 0-0; a draw might not be good enough, but we can still remain within striking distance of United, Arsenal and Tottenham. I see this as a tight game with chances few and far between. I’ll take Chelsea to win 0-1 with Eden Hazard slotting a 73rd minute penalty past Jordan Pickford. Next articleHas Maurizio Sarri Now Entered Survival Mode?